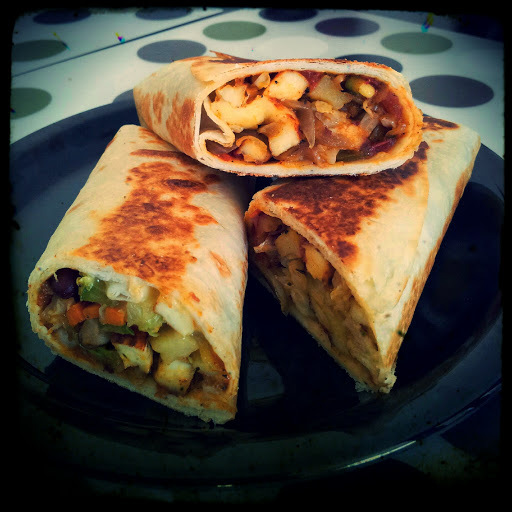 Recipe given below is not exactly the same as original ‘Kathi Roll’ – a street food from Kolkata. This is kinda SJ-Version of it. 1. Prepare a soft dough by mixing all ingredients given for roti and cover it with damp cloth. Keep it aside for 2-3 hrs. 2. Take oil in kadai. Add green peas, babycorn, cabbage, carrot and mix everything well. 3. Add boiled potatoes, cubed paneer and spring onions with salt, chilly flakes and herbs. Cook it for 2-3 mins. 4. Bring stuffing to room temperature before proceeding further. 5. Meanwhile, roll out each ball of dough to the size of roti. 6. Half roast them on hot griddle. 7. Stuff each roti with portion of stuffing in middle. 8. Apply cornflour slurry on sides and ending. Wrap it like a roll. 9. Roast it on griddle again till it becomes lil crisp. 10. Serve with hot sauce or mint chutney.